Warner Bros. and DC have been too busy trying to launch Batman v Superman this weekend to worry about Green Lantern Corps. The movie doesn't come out until summer 2020, and it's rumored that the character doesn't even show up in Justice League Part 1 until the final act. While the first appearance of the new Green Lantern will probably be a cameo similar to what we saw with Aquaman, the Flash and Cyborg in Dawn of Justice, it sounds like it's about time for the studios to make a final decision on who will play this iconic character. Especially since the movie is shooting this April. And according to Tyrese Gibson, he's still in the running. Green Lantern Corps. is said to incorporate a number of different Green Lantern characters, with John Stewart and Hal Jordan leading the team. Though, only one of them will appear at the tail end of Justice League Part 1. 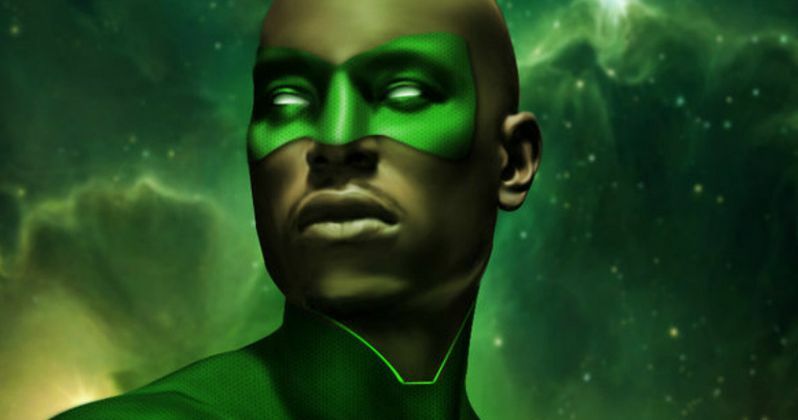 It isn't known if the DCEU will first introduce John Stewart or reboot Hal Jordan, but Tyrese Gibson has long-petitioned to play Stewart after fan art of the actor depicting that particular character started to spread like wildfire on the Internet. Tyrese Gibson confirmed in a previous interview that he was in talks with DC about playing John Stewart. In a new interview with Larry King, he explains exactly what went down. He claims he's still very much in contention, but has yet to hear back from the studio. And he goes onto admit that he made Warner Bros. a little bit mad about the whole thing. He explains how the fan art started the ball rolling. "I was like, 'Woah, that looks cool.' And I posted it on my Instagram, and it just went crazy - over 1,500 sites. And it was just all of this buzz, and I was like I might as well run with this thing. And I did. Pissed the people off, a little bit, at Warner Bros. because they thought that I had convinced the world that I had landed the role, which I didn't. And I said, 'If you go down my timeline, at no point did I say the role is mine.' But, you know, there have been other artists, actors and actresses who have put up images of them as a comic book character and ended up landing a role. So I was like, it's worth giving it a shot." While he has never heard back from Warner Bros., which really isn't a great sign, the actor remains forever hopeful until the day an official casting announcement is made. When asked if he's had any direct contact with Justice League Part 1 director Zack Snyder, Tyrese Gibson reveals he hasn't yet spoken to the man behind this weekend's Batman v Superman. He goes onto say. Related: Does Justice League Have a Green Lantern Cameo? "No...I did meet with Warner Brothers, though. I do [have a shot]. I would love it. I've taken the oath. I would love to do it. I got the muscles for it. I can do 1,500 push-ups right now." Tyrese Gibson has proven himself as an action star in the Fast & Furious franchise. But playing John Stewart in Justice League Part 1 and Green Lantern Corps. will be a superhero first. What do you think at this point? Should the man just give up the ghost? Or are you as hopeful as the actor that he's landed the role? Sound off in the comments below.